Last Updated: December 3, 2013 | Subscribe to our weekly newsletter! Unfortunately, the responsibilities of pool ownership don’t end when swimming season does! 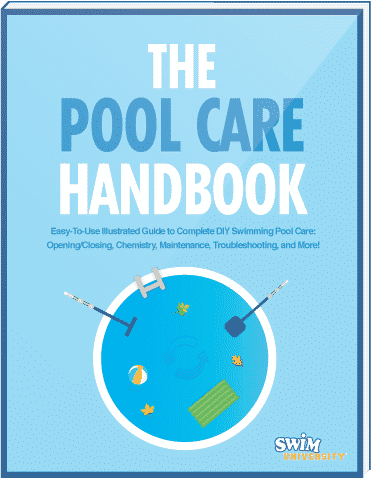 It’s important to continue caring for your pool during the off-season (fall, winter, and early spring) to ensure a successful and clean opening. Use an algaecide or algaestat (preventive), particularly one that stays in the water for a good length of time If you click this link and make a purchase, we earn a commission at no additional cost to you. .
On the last day of operation, add this to the water and run the pump for 24 hours to fully circulate. Then shut down the circulation system for the winter. By keeping the green stuff away as long as possible, pool startup will be much easier. As winter approaches and you plan to close the pool, remember to check your pipes and motorized parts. Drain the water from the pump, pool heater and filter. You also want to drain the water 4–6 inches below the pool skimmer. As the temperatures begin to dip to freezing levels, any excess water in these parts can freeze. If that happens, the pipes can crack, which can cost serious money in the long run. Remember to also completely remove any water that has accumulated on top of your pool cover to keep it from freezing. You can shop vac If you click this link and make a purchase, we earn a commission at no additional cost to you. or use a sump pump If you click this link and make a purchase, we earn a commission at no additional cost to you. .
You should absolutely have a winter cover for your pool. A dirty but safely covered pool beats a sparkling clean but uncovered pool any time. There simply is no better insurance for keeping toddlers and wildlife out of the pool. If possible, keep the water level where it’s supposed to be, and the pumps running. As soon as the water thaws in the spring, pop open a corner of the cover and add liquid chlorine to the pool (1–2 gal. for an average in-ground pool). You can do this yourself, or hire a professional to do this for you. This is the most important step. When your pool is opened, vac on waste to help remove the debris from the bottom of the pool. If you try to vac the sediment from the bottom of the pool and run it through the filter system, you may find that the sediment is so fine that it goes right through your filter. If you find your pool is pea-soup green in the spring, add more liquid chlorine, allow your filter to do its work, and monitor the progress. Be patient. If you don’t see progress in several hours, repeated doses of chlorine If you click this link and make a purchase, we earn a commission at no additional cost to you. and algaecide If you click this link and make a purchase, we earn a commission at no additional cost to you. may be in order, and your pool may benefit from an extra vacuum session. Having clean, clear water in the spring makes your life much easier. One key element in achieving that is a properly fitted safety cover. It your pool cover doesn’t fit, it’s an invitation for dirt, debris, and even small animals to find their way into your pool. If the fall has been mild and warm, it’s a good idea to check the pool and add more chlorine and algaecide just ahead of the colder season. If you live in an area that has heavy rains in the fall and you use a mesh cover, much of the winterizing chemicals you use may become diluted. Then, just before the first big freeze hits, charge up the chemicals to help ensure the water makes it through to spring startup without an algae bloom. Using an enzyme product If you click this link and make a purchase, we earn a commission at no additional cost to you. during the off season (even poured through a mesh cover when the water is not frozen) will help to break down non-living organic contamination that will inevitably make its way into your pool during winter. Some of this contamination includes bird droppings, pollen, or even bather contaminants left over from your pool season. An off-season enzyme will help prevent the waterline ring that can occur through the winter, which would normally require a lot of scrubbing in the spring. If leaves, sticks and other junk accumulate on your pool cover throughout the winter, you can end up with a nasty stew of stagnant water, which is a mess to remove and some of it often ends up in the pool. Using an air pillow If you click this link and make a purchase, we earn a commission at no additional cost to you. connected to the cover in the center of the pool not only protects your pool from snow and ice damage, it also disperses water and debris to the sides of the pool making cleaning easier. You want to keep some water on the cover to help stabilize the cover in the wind, but you don’t want any debris. Periodically check your cover cable to make sure it’s tight. If the cable becomes loose, the cover might start to slip into the pool. Check your air pillow to make sure it still has air in it. If you see it starting to go flat, get another one, slip it under the cover, and blow it up. Use a winterizing product in the water that has some biocidal properties to slow or prevent microorganism growth. The principles you follow in the summer also apply to the winter. If you can maintain proper pH sanitizer levels at all times, pool care becomes easier. The challenge in cold environments is that water is not being circulated, the pool is covered, and a typical sanitizer like chlorine will degrade and disappear during the long winter. This is why many winterization products If you click this link and make a purchase, we earn a commission at no additional cost to you. include algaecides that are stable and will stay in the water for extended periods of time. Most algaecides will survive the winter and slow or stop algae growth; some of these products may even slow bacterial growth. Also, open the pool before the water gets too warm. If you wait until later in the spring to open the pool, you’ll likely have more algae growing in the pool.